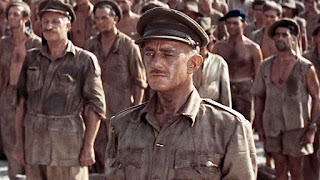 An epic war film directed by David Lean, The Bridge On The River Kwai brings the folly of global conflict down to individuals navigating matters of principle, discipline, courage and honour. The film is a grand exposition on men under duress, grappling with military doctrine, bound by their own understanding of the rules, and influencing events in all the wrong directions. During World War Two, captured British soldiers under the command of Lieutenant Colonel Nicholson (Alec Guinness) arrive at a Japanese prison camp deep in the jungle of Burma. The camp commander Colonel Saito (Sessue Hayakawa) is under pressure to build a rail bridge over the river Kwai as a critical piece of a new Japanese supply line. Saito wants to put all the prisoners to work on the bridge immediately. Citing the Geneva Convention and standing firmly on principle, Nicholson insists that British officers cannot be forced into manual labour. A long standoff between the two men ensues, with Nicholson held in a cramped cell but refusing to yield. His men, meanwhile, do their best to disrupt the bridge construction. Also at the camp is American prisoner Commander Shears (William Holden). He spends his time feigning sickness and whiling away the hours in preparation for a daring escape attempt. Once Nicholson resolves his dispute with Saito, he commands the British soldiers to demonstrate their superiority and skill by building the best possible bridge and meeting Saito's schedule. Despite deep misgivings from some of his own officers including the unit's doctor Major Clipton (James Donald), Nicholson becomes obsessed with the bridge project, seemingly oblivious that he is aiding the enemy. Meanwhile, Shears' escape is successful and he lands at a military hospital in Ceylon. Major Warden (Jack Hawkins) approaches Shears to join a commando unit planning to go back into the Burma jungle to blow up the bridge. An adaptation of the book by Pierre Boulle (only loosely based on real events) and produced by Sam Spiegel, The Bridge On The River Kwai is a cinematic masterpiece. Both in visual splendour and a keen focus on the motivations of a few men, the film establishes a firm grip and never lets go. Lean effortlessly combines the massive scope of a conflict that has infiltrated the deepest jungles of Burma, but that will still be decided by the actions of a few determined men according to their own deeply ingrained codes of conduct. This is a long war film with surprisingly little combat action. Battles of will, rather than battlefield action, dominate. Most of the running time is occupied with creating a fascinating jungle prison environment and exploring the tension between Nicholson and Saito, two opponents equally entrenched and both unable and unwilling to find the middle ground. Nicholson stands on principle and sacrifices his health and the health of his officers, all of whom are held in a cramped prison box. Saito tries to save his honour and prove his stature, but at the expense of progress on the bridge project that will determine his future. Emboldened by winning the first battle of wills, Nicholson loses all perspective. Now determined to push his advantage as the smarter, better man, Nicholson quickly veers into hubris, places all his ego in the bridge project, and he starts delivering on Saito's agenda better that Saito ever could. In Nicholson's eyes striving for excellence is an essential goal to raise troop morale, retain discipline and build a long-term legacy project that demonstrates British superiority. For most everyone else, he is aiding and abetting the enemy. Nicholson is a fascinating study of unchecked arrogance masquerading as leadership, a small man who allows the sparkle of short term tactical gains to obliterate his judgement of longer term goals. Commander Shears offers an altogether different perspective. Fed up with war, hiding his own secrets, and not quite caring what happens and why, he risks everything on a low probability escape attempt. When he remarkably does make it out of the jungle alive the last thing he cares to do is seek help for his former fellow inmates. Instead he spends his time romping with attractive women. All but forced to join the under-equipped commando team, Shears will have to overcome his own lack of conviction and find motivation in the specifics of the mission. The film does offer up interesting but questionable cultural references. 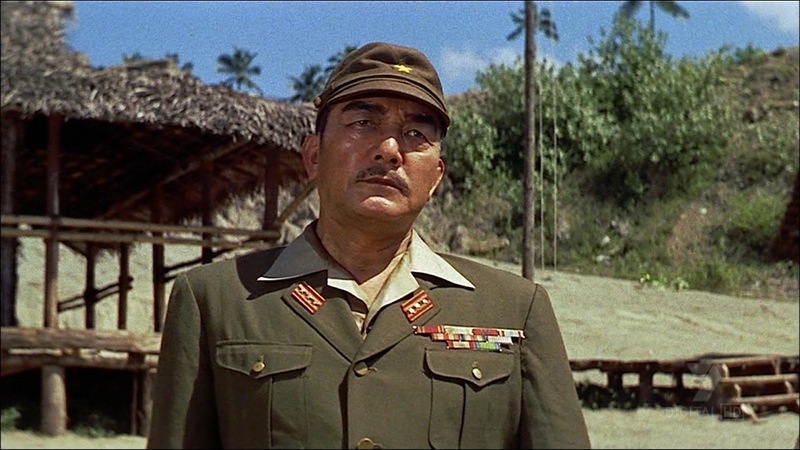 Nicholson is able to humiliate Saito, and the movie sides with the simplistic sentiment that the British are better at building a bridge than the Japanese. Meanwhile, Shears represents the Americans, initially not interested in the war effort and letting the British fend for themselves, but eventually riding into battle to dramatically affect the outcome. Alec Guinness delivers one of his career defining performances as Nicholson, the seemingly ideal servant of the British Empire. Guinness creates a character that is unflappable, fearless and able to eventually turn any situation to his advantage, but just lacking that essential ability to think beyond the medium term. The Bridge On The River Kwai stands as a monumental metaphor for war: built by soldiers to conquer territory in the middle of nowhere, costing the lives of many and a prime example of perfectly executing the wrong strategy.